Talk Nerdy To Me: Kai Deken Chapman! 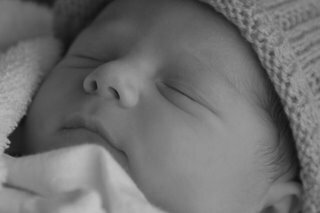 This is our beautiful son Kai....born on August 3rd at 8:07 am. 9lb 11oz, 22 1/2 inches long. Yay! The day has arrived where I can finally upadate the blog!! I will try to not give too many details as I don't want to deter others from having a baby but I will share a bit! First of all, welcome home to our son; Kai Deken Chapman. Kai means a couple different things like `ocean' and `beautiful' (apparently `egg' in Thai but we didn't know this). We just like the sound of it. Deken is my maiden name and means `one who serves'. 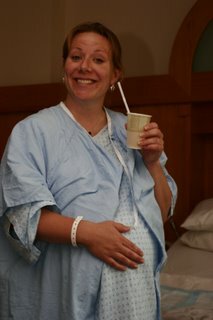 Here's a picture of me after having contractions for about 21 hours at home and finally going to the hospital. Apparently because these contractions were 10 minutes apart, they are not considered `active labour'. We went in on August 2nd at 5pm where they found that I was 3cm dilated. Half an hour later, I was 5 cm dilated and they broke my water which was probably the most entertaining part of the evening. It made me laugh a whole lot because I was so embarrased by the amount of water that kept coming out..who knew it could be that much! I'll summarize the rest but basically everything went well until 1am when I was 10 cm dilated and ready to push. I was using the gas which made me a little silly but the nurses kept assuring me I was getting an A+ in everything which made me feel good:) Gary did a great job of making me drink water and do the deep breathing. I pushed for 1 1/2 hours and nothing happened even though I kept thinking someone was gonna say `there's the head!'. 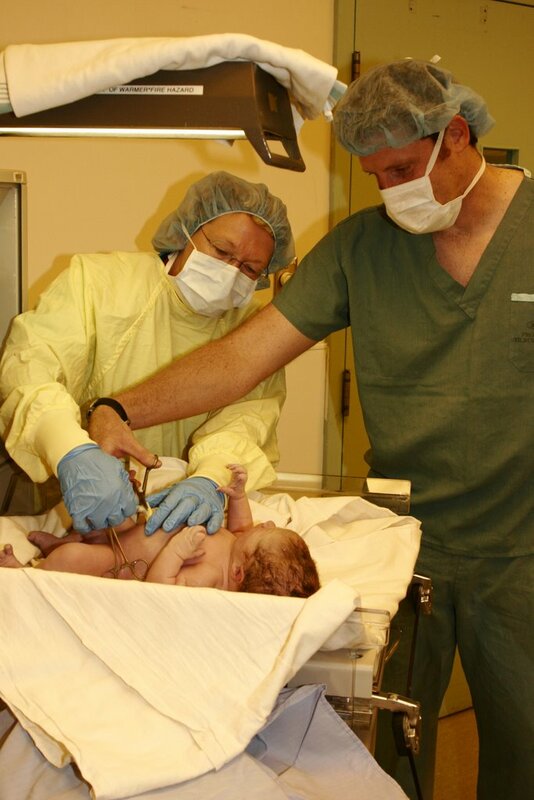 So, they gave me an epidural so I could push a few hours later after some `rest'. Ya right, I'm not gonna rest, I want this baby out! So, at 6 am I pushed for another 1/2 hour where they concluded that our baby's 95th percentile head would not fit through my average size pelvis. I needed to have a C-section. Here's our first family photo! I was shocked to see head full of dark brown hair and I was really excited that he seemed so cute and all the parts were there. Oh ya, I was glad the 30+ hours were over and I could finally meet the little guy that had been taking up so much room inside my belly. 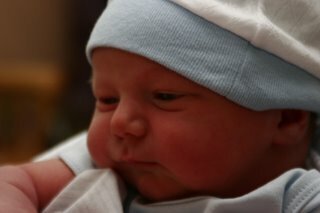 Here he is on day 2 with his eyes open. He's so cute and is adapting really well to the outside world. We are so thankful for him and for all of your prayers and concerns during this time! Thank you and I hope you get to meet him soon! Congratulations guys! I'm glad to hear that things are going well for you guys. Welcome home! He sure is a cutie. yay! 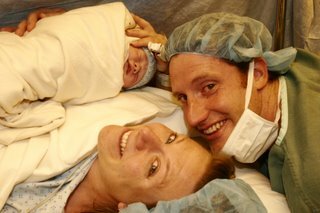 that's so exciting that your little guy is finally here. he looks adorable. congratulations! Congratulations you guys. Kai is beautiful and it must be great for you all to be "on the other side" of pregancy. Hope your summer is going well. Talk to you soon Gary (3 weeks...yikes). Sean, Leanne and the Engbers Clan. Congrats Loudog and Gary. You are going to be great parents. Kai's a great name too. Congratulations you two. He is absolutely adorable. Congratulations you 3! I'm so glad the long labour is finally over for you (sorry it was so difficult) Can't believe how big he'll be when I see him sometime in October! What perfect timing for Gary to be able to be home for 3 weeks! Congratulations! He is gorgeous! I hope your recovery goes quickly and well! Hey Lou, Gary & Kai! Congratulations! Lou you're going to be the funnest Mom ever! Have tons of fun getting to know your new little guy! Congrats, Louise and Gary! He looks so beautiful... Enjoy getting to know the little guy. Congratulations to both very proud parents! You'll be in our thoughts and prayers. Congratulations! Good to know all his parts are there and intact. Yay and congrats! Really happy for y'all, and look forward to meeting Kai. Congrats Louise and Gary. He is a beautiful little boy. I have to say good going on the labour. Jack was 9pds 8 oz and that was one hell of a labour. Kudos for the 9 11 baby. Enjoy every second.